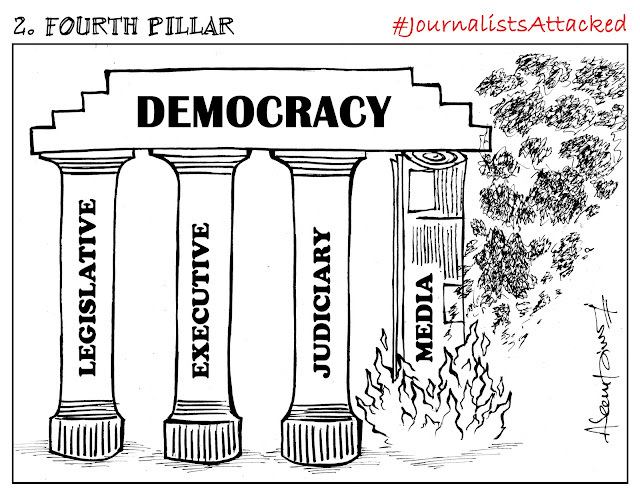 Aseem Trivedi wants us to share his cartoons – and to join him in sharing cartoons if so inclined. He wants us to send suggestions. What should ‘B&W’ campaign for? Do you know of an issue that should pursued here? ‘B&W’ is about detailed cartooning on topics that matter: human rights violations, corruption, conflicts of interest, broken systems, abuses by institutions and individuals with power, whether that’s government, nonprofits, or the press itself. Mail your suggestions and ideas to mail.bandw@gmail.com with ‘suggestion’ in the subject line. If you want to start a campaign through your art, you’re most welcome to join the crusade. You can send your cartoons on any local or international issue to get them published and circulated by ‘B&W’. You can also contributet to any of the cartoon campaign launched by B&W. Mail your cartoons mail.bandw@gmail.com with ‘submission’ in the subject line. You can help ‘B&W’ cartoon campaigns by circulating the cartoons and PDF copies of the magazine. You are always free to post, publish and exhibit the cartoons where ever you feel as all of these cartoons are free from any copy right and are created to help the campaign. You can also suggest some ways for better and effective circulation of the magazine. 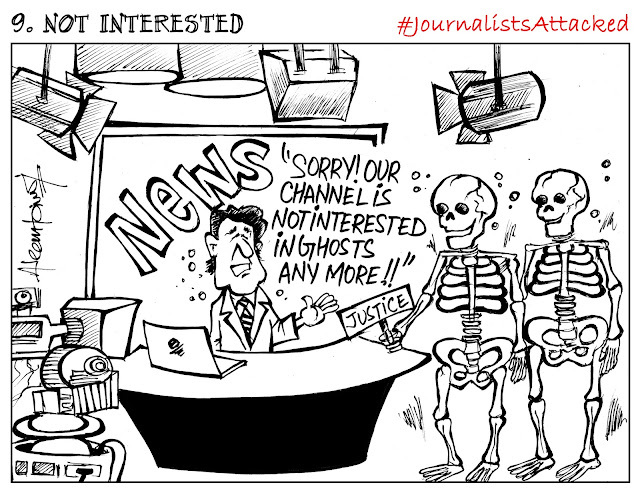 He has a set on recent killings of journalists in India. Two journalists in India died this month after being set on fire. In the first case, Jagendra Singh, a freelance journalist from the Shahjahanpur district in Uttar Pradesh, was allegedly set on fire for his reporting. Police have registered a murder case against several officers, other men and state dairy development minister Ram Murti Singh Verma. Singh, who operated a Facebook page called “Shahjahanpur Samachar” (Shahjahanpur News), uploaded posts regarding the alleged involvement of the minster in illegal mining and land grabbing. Verma, along with others, has been named in the first information report (FIR) although a forensic report suggested that Singh might have burned himself. In the second, a Madhya Pradesh journalist Sandip Kothari was kidnapped and later burned to death, allegedly by the mining mafia.